The TV blew up last week. On the first night Mr B and myself found ourselves actually having to talk after the kids went to bed. 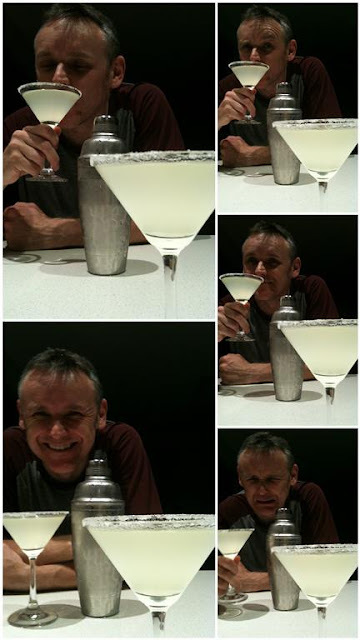 By the second night we gave up and hit the Margaritas! Today is Gareths Birthday Party. He decided on a pool party and invited 6 friends to join in the fun. I think this one photo sums it up! Gareth is still milking the gap between his actual birthday yesterday and his birthday party tomorrow. It is a slab of vanilla cake with some cut out and covered in sugar icing. He was so excited when we filled it with blue jelly and a plastic shark! Roll on tomorrow so he can eat it! For his birthday he got a scooter. And a book of The Worlds 100 Most Disgusting things. Tonight he went to bed the happiest boy in the world! In the traditions of our family he gets to choose the menu for tomorrow nights family meal. Following the last few months of Junior Masterchef he has been trying new and exotic foods. He has been open to tastes and flavours that he would have refused a year ago. I wondered what he would choose. Tandoori chicken and prawn pizza? Rack of lamb with herb crust? I arrived home from a long day at work and grabbed the mail from the letterbox and unlocked the front door to get in out of the rain. When I saw the square white envelope with the English stamp I threw the boring bills on the table with the car keys and sat down for 5 minutes with a smile on my face! It was from a good friend in England. Four of us would get together at least once a week to chat and have coffee while our kids ran around our feet playing. We met 12 years ago at ante-natal classes while we were heavily pregnant with our first babies. There is a lot to be said for friendships that share the experience of those first few months of being a mum. Finding friends that share and empathise as you struggle with young babies and learn as you go how to be a mother. It's hard to be fake, to keep a mask of perfection as you sit sleep-deprived rocking a teething baby and watching your coffee go cold just out of arms reach. I made some wonderful friends in those first few years of motherhood. Friends who passed the tissues and let me cry when things were hard. Friends that got as excited about my babies milestones as I did about theirs. Friends that made the decision to emigrate a hard one. Friends that still take the time five years down the line to write and even to put a little coffee stick in the envelope so I can "join-in" as I catch up on all the news about the kids, their families and all that is changed and all that is still the same. Well Zoe if that is true here is to the next 28! Our remaining little Guinea Pig Tigger has been very withdrawn and has been pining hiding in the bedroom of her hutch. She won't interact with us and is only eating small amounts. I encouraged the kids to cuddle her and give her lots of attention. Rhiannon took her role very seriously and climbed in to the grass run with her and brought her homework with her. She spent the next hour there keeping Tigger company while doing her school work. Yesterday evening Byron came home from work a little later than usual. He had a cardboard box under his arm. Without consultation with anyone else he decided we needed a playmate for Tigger and so now we have a new addition to the family. She is a tiny 6 week old guinea pig that the kids have named Ivy. They are overjoyed to have this fluffy little fur ball to fuss over and it really has cheered up Tigger who runs up and down the ramp in her hutch with the baby following her every move. Her appetite is back and she is now scoffing carrots and grass again and looking perky. Today I feel so sad, so flat inside. Like a weight is in my chest. My kids are upset and I can do nothing to change it. We had a hot day yesterday. It was about 30 degrees in the morning and the kids wanted to swim in the pool. They put their three Guinea Pigs in the wire run on the grass to get some exercise and then they jumped in the pool. As I sat and watched the kids the sun got warmer and warmer and I threw a shade cloth over the Guinea pig run to take the glare off them. After about an hour and a half I got the kids out of the pool and we headed inside. The kids stopped to put the guinea pigs back in their hutch and found that their beloved Jaffa was dead. The other two guinea pigs were very limp. We carried them into the house and gently dampened them down with tepid water and tried to revive them. We held Splodge and watched her move around and thought she was going to be ok but over the next few minutes she died in our arms. The littlest guinea pig who was Splodges baby was also very weak. Over the next few hours we sat with her and cooled her down and tried to feed her drops of water from a syringe. She refused all food and drink over the next 4 or 5 hours before finally eating and drinking tiny amounts. All through those hours we had tears and questions, sobbing and hugs. We searched for reasons why they had all been so badly affected by the heat. Most Australian summers days get to 30 degrees and more and yet these guinea pigs had been with us for almost two years without any problems. Maybe because it was the first warm day this spring and they were just not used to it? Maybe it was that they were getting a little older? Watching the kids bury the guinea pigs in the back garden with serious red eyed faces was heart breaking. I know that they were "just" pets but to our kids they were very special. I know that it is teaching them about life and death, about the feelings that go with it and how to work through them. But right now I would pay any money to take that sadness out of their eyes. To have waved goodbye to them in the school yard this morning without watching tears spill over onto their cheeks again. Not to have had to give another big hug, whisper more words of "it's ok" into their ears. Not to be sitting here in the house looking at our one surviving pet hiding in the corner of her hutch, refusing to come out and be cuddled. Refusing fresh slices of apple that would normally cause a flurry of squeaking and jostling to grab them from my hand. I'm dreading the school bus pulling up. I want to see smiles on their faces again. I will do what I resort to when I don't know what else to do. What Mums all over the world do when they want to make everything ok.
P.S: Three tiny fingernail sized paper guinea pigs made by Rhiannon last night. 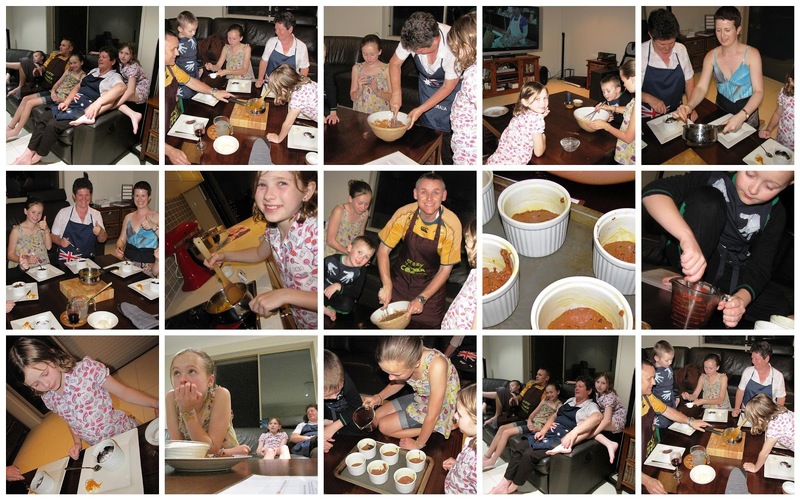 The Masterchef Cook-Along was great! The program started at 7.30pm and we had everything laid out on plates ready to bake. The kids were on the edge of their seats watching the first half of the show and waiting for the real action to begin. When it did there was a flurry of mixing and taking turns, passing the mixing bowl from one to another. Licking spoons, talking over the tv, missing bits of instructions and having to shhhhh and catch up! It was fast paced and it took our 6 pairs of hands to work as a team until the puddings came out of the oven. They smelt, good, they looked amazing, they tasted....like heaven! It was fun stopping to imagine all the other kids that were scattered around Australia and tucking in to this warm, chocolate, nutty delight at the same time as us. By the time the bowls were scraped clean it was gone past the kids bedtimes so they ran upstairs to brush teeth and jump into bed with the memories of hazelnut chocolate puddings still fresh in their heads. I got left with this....! TONIGHT there will be a celebrity chef in OUR kitchen helping our family cook up a storm. I've spent all day preparing the list that George sent me earlier in the week. I've chopped and sieved, measured and whisked. Tonight at 7.30pm George will help me and my kids cook Hazelnut Chocolate Pudding with Dark Chocolate Sauce, Candied Orange Zest and Cream Chantilly. My kitchen is gleaming (I even cleaned out my oven and then couldn't get the door to go back on but that's a whole other story) All I need to do now is go shower and spend a little time choosing a cute yet practical outfit for this evening. My heart is all excited and my cheeks are a little flushed. How has all this come about I hear you ask? Well I haven't been quite straight with you. George is going to be helping us whip up this chocolate delight this evening. Us and half of Australia. Tonight is a televised Cook-Along where thousands of kids around Australia will follow Georges instructions on tv and simultaneously cook and eat this dessert together! Maybe you will even join in. If so Happy Cooking! I will be back tomorrow to tell you all about it! We have been having some pretty heavy storms here in Australia recently. There was a particularly loud thunder storm last night. This little fellow managed to hop up to our tv room window and hid between the shutter and the glass as the wind and rain howled around him! I was working an early shift at the hospital today. When I came home tired and needing a cup of tea in my red chair I found out I had been replaced. ...having a 12 year old who learnt how to cook "Apple Puffs" in school this week! Here is a photo that got away. I found it when I was looking through some photos today. We had a picnic day with friends to celebrate 10:10:10. Even though it was still just Spring the kids all had their swimmers in the car and decided that it was a perfect day to swim in the lake. They were brave or foolish depending on your viewpoint! This is one of my favourites as Gareth jumped off the end of the jetty with our friends! There is a TV program that has taken Australia by storm. It is Junior Masterchef. A pint sized version of the original adult novice-wanna-be cooks. The contestants are aged between 8 and 12. They are amazingly confident in the kitchen and happily eat anything, many things that would be pushed away on my kids plates. It was fun following the recipe with the kids and trying to let them take charge and do most of the steps with minimal input from me. The best bit was watching them "Plate-Up" just like the kids on the tv show! 2. For lining moulds, brush two 350ml capacity shallow oval ceramic dishes with the melted butter. Sprinkle evenly with sugar shaking to cover. Shake out excess sugar. 3. For marinated cherries, combine cherries, sugar and orange juice in a medium bowl. Set aside. 4. For filling, combine flour and salt in a medium bowl; make a well in the centre. Whisk in egg, egg yolk, rind and vanilla bean paste until smooth. Combine milk and cream in a small jug and gradually whisk into mixture 1/2 at a time. Add sugar, orange juice, melted butter and chocolate and stir to combine. 5. Spoon fruit into prepared dishes and pour over batter until 3/4 full. Place in preheated oven and bake for 30-35 minutes or until tops are golden. 6. Meanwhile for cherry and rosewater compote, combine ingredients in a saucepan, simmer over medium-low heat for 8-10 minutes or until fruit is tender and soft and liquid is slightly reduced. 7. For mascarpone cream, beat ingredients in a mixer until soft peaks. 8. Serve clafoutis with cherry and rosewater compote and mascarpone cream to the side.